An Indiana sophomore shadowed NEXTRANS Researchers during her summer break in 2013. She learned what college life is like and, through experience with a driving simulator, learned the connection between technology and research. The NEXTRANS Center sponsored a prize, "Best Transportation-Related Project," at the 2012 Lafayette Regional Science and Engineering Fair, held March 3-4 at Purdue University. The Science and Engineering Fair draws students in grades 5-12 from across a twelve-county region in Indiana. Judging was based on 14 categories including: engineering, environmental science, energy and transportation, and math and computer science. Two NEXTRANS Center members attended the Science and Engineering Fair to judge entries based on creativity, accuracy, and real-world application. Matthew Campbell, a senior from West Lafayette, Indiana, received the NEXTRANS prize for his project, "The Effect of Phenol Compounds on Sugar Yields for Ethanol Production." The NEXTRANS Center was pleased to announce the winners of the 2011 NEXTRANS Indiana High School Essay Competition. Winning essays were chosen blindly by a panel of transportation scholars, Purdue University Discovery Park officials, and the NEXTRANS Center staff. Richie Stalbrink, a senior at South Central High School in Wanatah, Indiana, was awarded the $250 first place cash prize for his essay, "An Exploration of Alternative Fuel Options." Richie is a member of 4-H and National Honor Society. His interests include physics, chemistry and biology. He plans to major in chemical engineering in the fall. Andrew Adelsperger, a senior at Peru High School in Peru, Indiana, received the second place prize of $150 for his essay, "Factors Affecting Future Transportation." Andrew is involved in several extracurricular activities including Science Olympiad, student council, National Honor Society, varsity football and baseball teams, and youth group. In addition to many other awards, he was chosen to represent his high school at the Richard G. Lugar Symposium for Tomorrow's Leaders. This fall, Andrew plans to pursue a bachelor's degree in chemical engineering. Andrew Crampton, a senior at Hamilton Heights High School in Arcadia, Indiana, was awarded $100 for his third place entry. Initiated in 2009, the NEXTRANS Indiana High School Essay Competition serves to encourage high school students to consider how integral transportation is to the future of Indiana and our nation, and interest them in pursuing careers and/or higher education in the field. The NEXTRANS Center sponsored a prize, "Best Transportation-Related Project," at the 2011 Lafayette Regional Science and Engineering Fair, held March 4-5 at Purdue University. The Science and Engineering Fair draws students in grades 5-12 from across a twelve-county region in Indiana. Judging was based on 14 categories including: engineering, environmental science, energy and transportation, and math and computer science. Two NEXTRANS Center members attended the Science and Engineering Fair to judge entries based on creativity, accuracy, and real-world application. Michael Plite, a sixth grade student from West Lafayette, Indiana, received the NEXTRANS prize for his project, "Plane Wing Angle Stability and Distance." Using paper airplanes, Michael tested which airplane design would fly the farthest, while controlling for outside variables via a device intended to enforce consistency during "test flights." 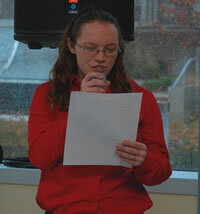 The NEXTRANS Center was pleased to announce the winners of the 2010 NEXTRANS Indiana High School Essay Competition. Winning essays were chosen blindly by a panel of transportation scholars, Purdue University Discovery Park officials, and the NEXTRANS Center staff. More than 60 students from across the state participated in this year’s contest. Matthew Prall, a senior at Columbus North High School in Columbus, Indiana, was awarded the $500 first place cash prize for his essay, “Creative Solutions to the Challenges Facing Indiana’s Automotive Industry.” Matthew is a participant in many extracurricular and community activities including: National Honor Society, Robotics Club, Science Olympiad, Columbus North High School tennis team, and Bartholomew County Youth Leadership. Following graduation, Matthew plans to attend college to study mechanical engineering. Sarah Torline, a senior at Shawe Memorial High School in Madison, Indiana, received the second place prize of $250 for her essay about funding opportunities and sustainability of infrastructure in Indiana. Sarah is a member of National Honor Society and the varsity girls’ cross country and track teams. She is also student council president and an avid traveler; following a trip to Spain in 2010, Sarah will spend two weeks in France this summer. This fall, Sarah plans to attend Indiana University - Purdue University Indianapolis (IUPUI) to study psychology and linguistics. Jacob Rogers, a sophomore at North High School in Evansville, Indiana, was awarded $100 for his third place entry, “Dedicated Truck Lanes on Interstate 70 Corridor.” Jacob’s hobbies include playing and watching sports, playing guitar, and spending time with friends. In school, his favorite subjects are principles of engineering, geography, world history, chemistry, and Spanish. Since 2004, Helen Hudson's English students at Crawfordsville High School have made it their mission to improve their local Amtrack station. Through the help of a problem-based learning (PBL) grant, CHS students have removed massive amounts of trash, painted the shelter, created a garden, installed a welcome sign and logo, and had the road leading to the station repaired. Five years later, the students continue to clean the station each week, host events such as "C-Ville Rides the Train," and even started a band called the Boxcar Adolescents, which uses instruments made from scrap metal found along the tracks. Their hard work caught the attention of NEXTRANS Director Srinivas Peeta, who invited the PBL classes to become secondary school partners. In May 2008, their display booth and presentations at the NEXTRANS Inaugural Summit drew keen interest, and student Chelsea DeLarm received a special award from RITA Administrator Paul Brubaker. One of Hudson's students, Jim Caraher, was selected to become NEXTRANS Center's first high school intern, and Crawfordsville High School had strong participation in the Center's first Indiana High School Essay Contest, garnering one winner (Chelsea DeLarm), and several honorable mentions. Most recently, Helen Hudson and her classes were invited to participate in the NEXTRANS Center's site visit on November 17th. The students seized this opportunity to showcase their accomplishments for USDOT officials, faculty from NEXTRANS partner universities, Advisory Council Members, and other Center guests. Through speeches, photos, and video, the students displayed their passion and unwavering commitment to promoting passenger rail travel in Indiana and beyond. 2009 Indiana High School Essay Contest winners Chelsea DeLarm and Mikayla Janney were honored on November 17th during the NEXTRANS Center’s first site visit conducted by the Research and Innovatitive Technology Administration (RITA). After reading excerpts from their essays, Chelsea and Mikayla were awarded certificates by Advisory Council Chair Joe Gustin. 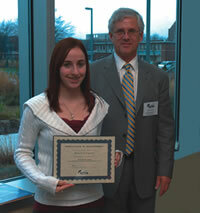 In addition, both students received checks for $250, and were recognized in the Center’s 2009 Annual Report. Left: Mikayla Janney accepts award from Advisory Council Chair Joe Gustin, Right: Chelsea DeLarm reads from her award-winning essay. Chelsea and Mikayla’s essays were chosen from more than 80 submissions by high school students across Indiana, which were judged blindly by a panel of transportation scholars, Purdue Discovery Park officials, and the NEXTRANS Center staff. The essay topic was, “Why is transportation important to the future of Indiana? What transportation challenges is Indiana facing, and how might we solve them?” The goal of this competition was to encourage 9-12 grade students to consider how integral transportation is to our lives, and interest them in pursuing transportation-related careers and/or higher education in the field. NEXTRANS is currently seeking qualified applicants for the NEXTRANS High School Internship in Transportation. This program provides qualified students the opportunity to complete a 4-6 week program of research and activities at Purdue University, where participants will be exposed to the field of transportation through hands-on research activities under the guidance of a NEXTRANS Research Associate. By fostering a challenging environment in which students learn through discovery, the Center hopes to attract a new generation of leaders to transportation-related careers. Applications are accepted on a rolling basis, and each 4-6 week program is scheduled to suit the individual student’s needs. Students will work approximately 5-10 hours per week at the NEXTRANS Center, and will be compensated for their time ($8-10 per hour). Applicants should live in close proximity to the West Lafayette/Purdue University area. To apply, or for additional information, please contact Andrea McIntyre via phone (765-496-9734). In 2005, Crawfordsville High School (CHS) English teacher, Helen Hudson, and her students began an effort to improve their run-down local Amtrak station. The students, whose laptop computer grant mandated them to take on a problem-based learning project, saw an opportunity in the Amtrak station. In the years since, students have cleared off scores of bags of trash, planted a garden, installed a welcome sign, and replaced the aging station floor. The students and their teacher, Hudson, received several local and regional awards for their work. In 2006, a group of students traveled to Washington D.C. to present their projects for the national association of rail passengers. While there, they received NARP’s Youth Leadership Award, an award only given twice in 40 years, and also spent time lobbying for legislation that would provide much-needed funding to Amtrak. During the Fall of 2006, they were honored with Amtrak’s Champion of the Rails award. The students have written editorials, organized Crawfordsville Rides the Train public awareness trips, and continued to care for the little Crawfordsville Amtrak station and the adjacent garden that they have landscaped and planted. The classes have also made efforts to promote rail travel closer to home. Their most recent effort, “C’ville Rides the Train,” is a weekend trip to Chicago to encourage Crawfordsville residents to take the train more often. Since the beginning of the project, the number of people riding the train from Crawfordsville has gone up by as much as 33 percent in some quarters. At the NEXTRANS Inaugural Summit, students from Hudson’s class participated by presenting a poster about the history of the project, setting up a display booth featuring their awards and honors, and attending the day’s sessions on transportation challenges and solutions. Their booth and presentations drew keen interest and broad attention from the Summit participants. NEXTRANS was pleased to host its first high school intern, Jim Caraher. Jim graduated from Crawfordsville High School, where he was Salutatorian of his class. At Crawfordsville, he was involved in the National Honor Society, Math and Science Teams, Tech Club, Libro Club, French Club, and Chess Club. He played soccer and track, and advanced to the state finals this year in the 800m run. Jim is a National Merit scholar and has also been awarded an Elks State Scholarship, the David Wells Science Award, and Purdue’s prestigious Stephen C. Beering Scholarship. The Beering Scholarship is named after Purdue University's president from 1983 through August 2000. A distinguishing feature of this invitation-only scholarship is the fact that in addition to paying for undergraduate studies, it also pays all expenses if a student decides to stay at Purdue to pursue a master's degree or a doctoral degree. Jim began his undergraduate studies in engineering at Purdue in 2007. He assisted NEXTRANS student Sal Hernández, a Ph.D. candidate, in conducting research to identify innovative new approaches to help the freight carrier industry utilize trucks to their fullest capacity. Rising fuel prices are making less-than-truckload (LTL) shipping a major economic burden. Their research involves disseminating surveys that will be used to develop new operational models that can help LTL carriers enhance capacity utilization in order to increase revenue.